These are the first examples of a new design for Raku tea light holders. They have a white crackle glaze and shell imprint. As usual with Raku, each one comes out with unique detailing on the basic design. Size is approximately 3 cm high and 3 cm diameter. You can see them on display at Bucks Open Studios, Broomfield Farm in Great Missenden this weekend. See previous posts for full details of BoS. 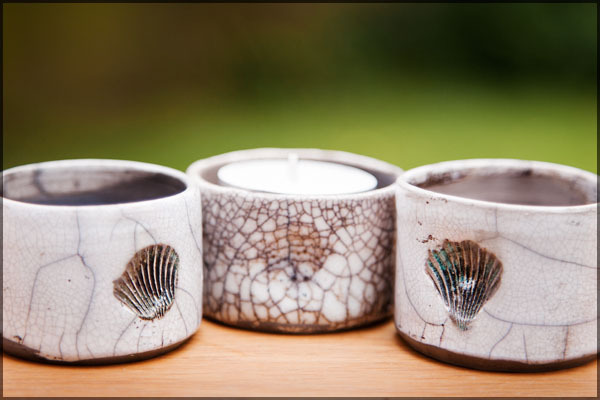 Raku tea light holders with white crackle glaze and shell imprint. This entry was posted in New work and tagged raku on June 19, 2014 by Carol.